Welcome to my very favorite room at StoneGable… the kitchen! If you visit me, you will probably find me here. I love to putter and cook and spend time in this room that collects people like honey. Everyone gravitates to the kitchen, especially during Christmas. 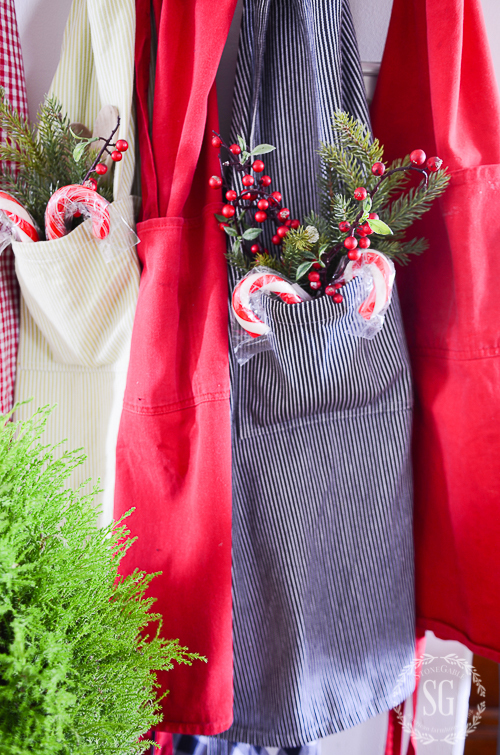 My aprons are embellished with greens and berries and candy canes and a little flour from baking cookies. They are hung on my plate hooks with care. I hope that Saint Nick will soon be here. It won’t be long now… but while I’m waiting for that jolly old elf why don’t you come on in and look around! Town and Country Living and The Everyday Home. as each day will feature a different room. 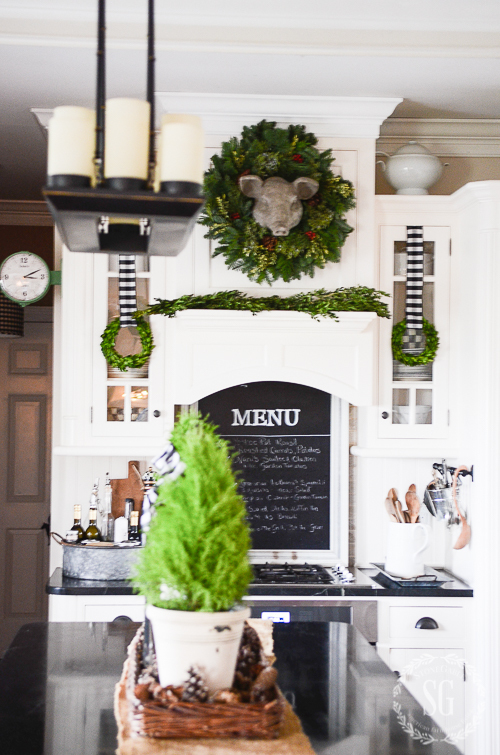 I’m sharing my Christmas kitchen today! My kitchen is a workhorse so I keep it pretty free from seasonal decor. 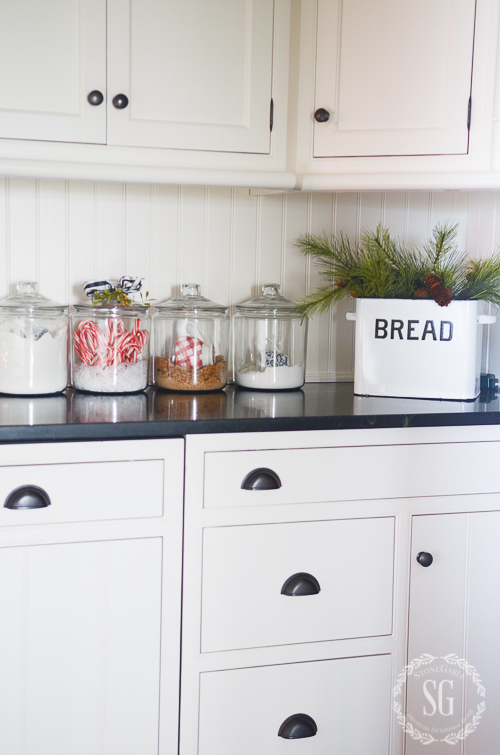 I love uncluttered counters so I embellish them lightly with Christmas decor. 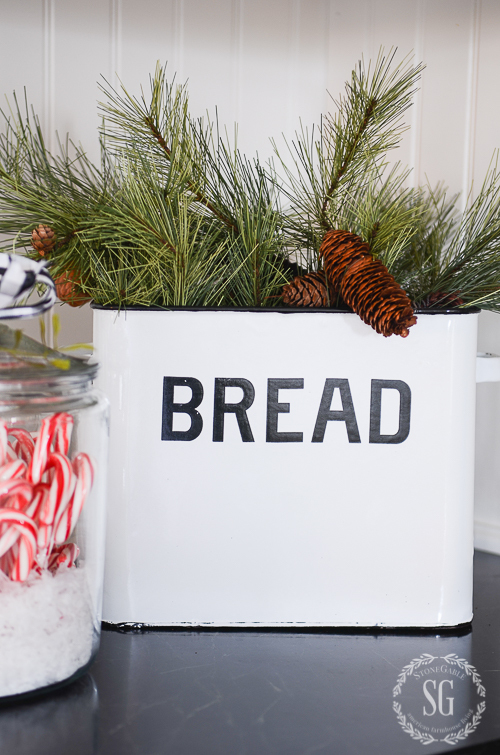 My vintage breadbox holds greens during Christmas! 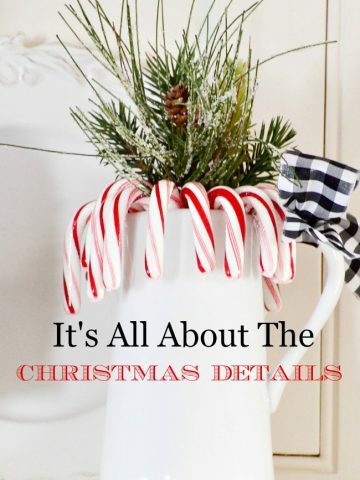 And one of the big glass jars on the counter has candy canes in it. YUM! 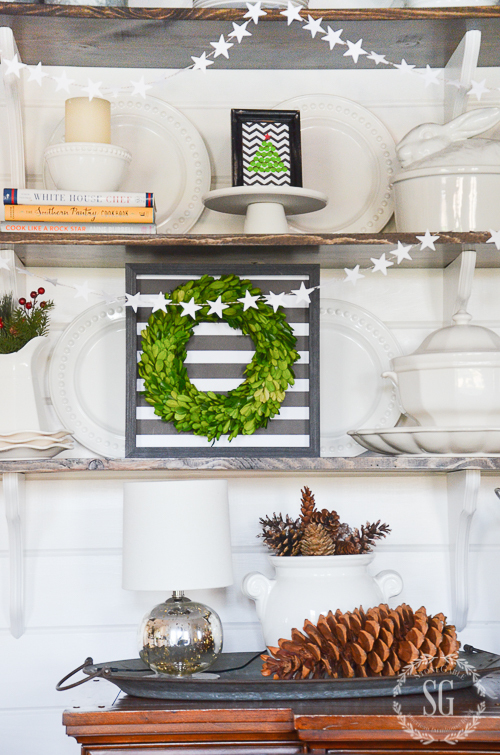 Adding greens to my black and white kitchen makes it festive and a bit sassy! I love mixing blacks, whites and greens. I’m using black an white checked ribbons again this year. 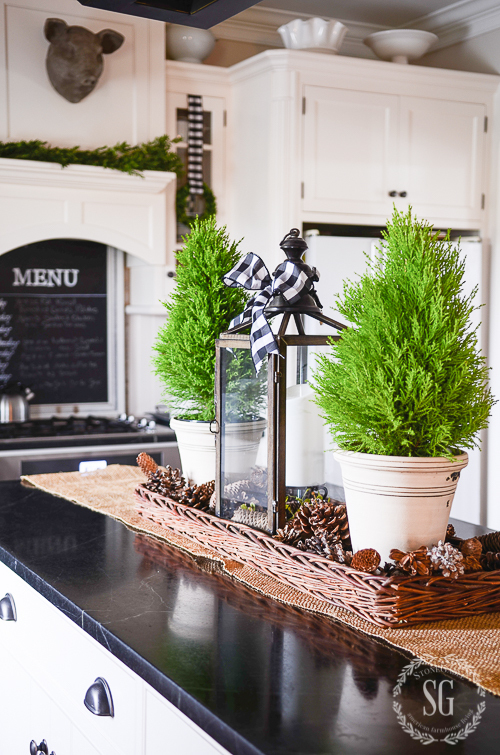 Boxwood wreath flank the cooktop and stove. Earl the pig, aka The Earl Of StoneGable loves his wreath necklace. Isn’t he handsome? He’s ready for Christmas! Earl has a big job keeping an eye on everything that goes on in the kitchen! If you would like to know how to keep live cut greens looking fresh longer click HERE. I soaked the wreath for 24 hours and then sprayed it with an antitranspirant to keep it fresh. You can find out more HERE. 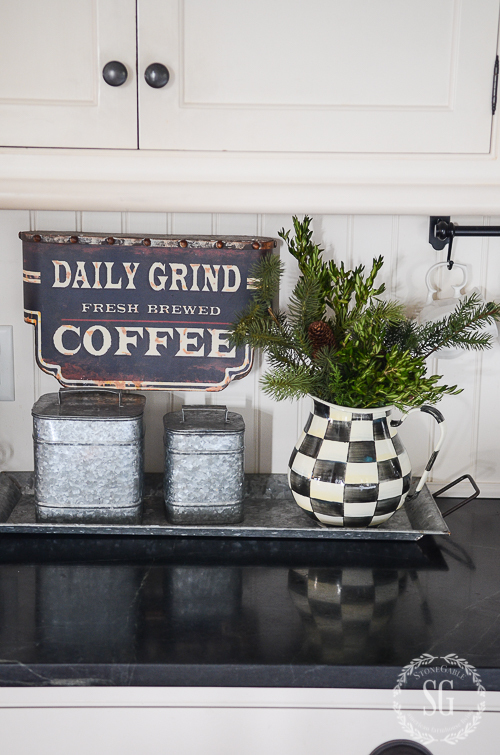 Our coffee station gets a workout daily! 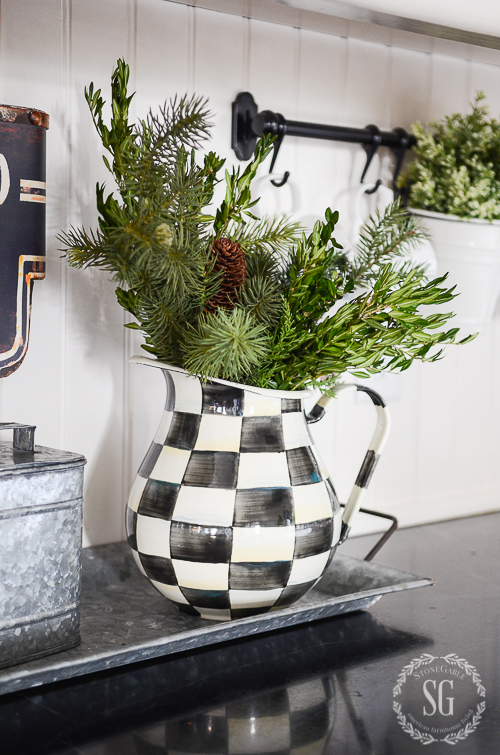 My “Courtley” pitcher from MacKenzie-Childs is filled with a variety of greens. I’m wild about Lemon Cyprus trees. They do very well inside as long as you water them often! I put them in a long basket of pine cones and they flank a big lantern. The kitchen cart at the end of my island has a few Christmas decorations on them too. Now I mostly decorate with green and organic things. 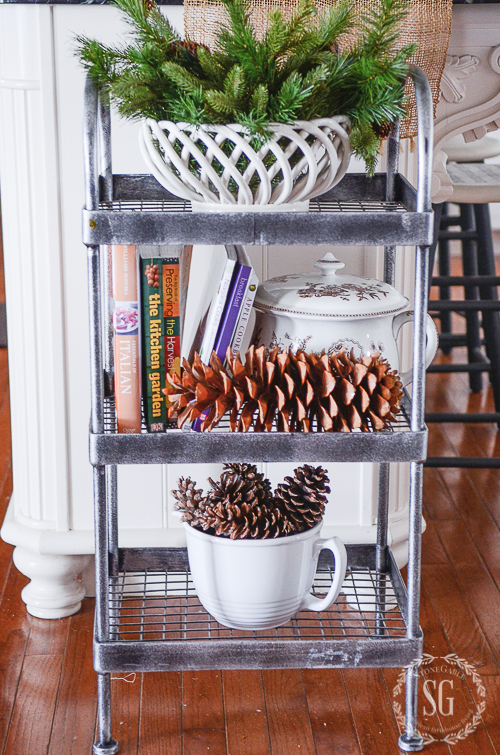 This cart is a good example of my Christmas style! If you come to StoneGable I’ll probably answer the door in my apron! My breakfast room is just off the kitchen. 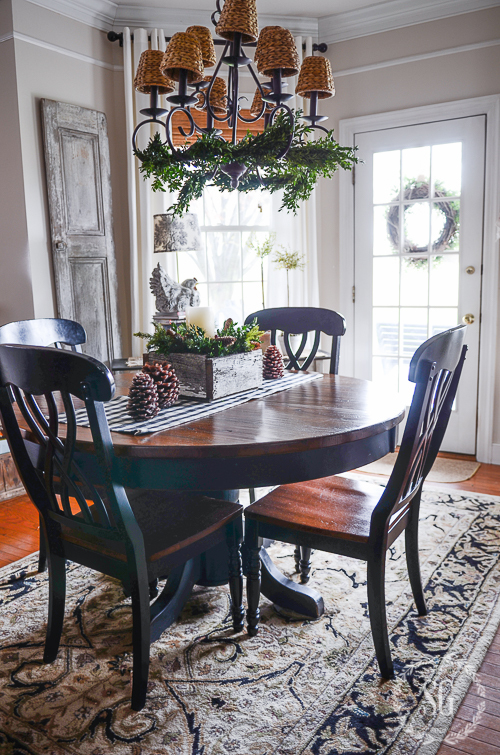 A Christmas 10 MINUTE DECORATING arrangement dons the center of the kitchen table. If you would like to see how to make this so easy decoration click HERE. Our new open shelves are across from the table. I’ll be busy in my kitchen from now until Christmas baking and making dishes for Christmas Eve, Christmas Day and the weekend! 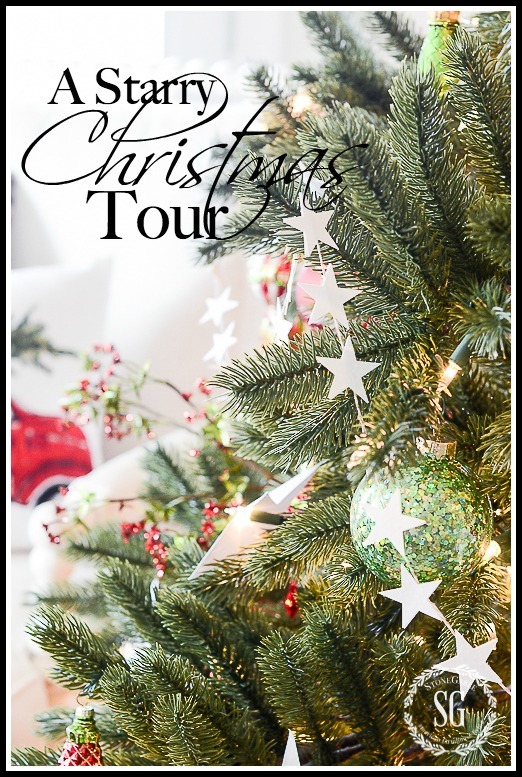 You might want to see my STARRY CHRISTMAS HOUSE TOUR. Or my CHRISTMAS TREE this year. Υvonne I love love all of your decorating ideas. Your kitchen is beautifully decorated.Once again thanks for sharing . I can’t decide what decor combinations I like best, either black and white, or blue and white, so I have both in various rooms. I love your kitchen and all the interesting, unique items you have collected. 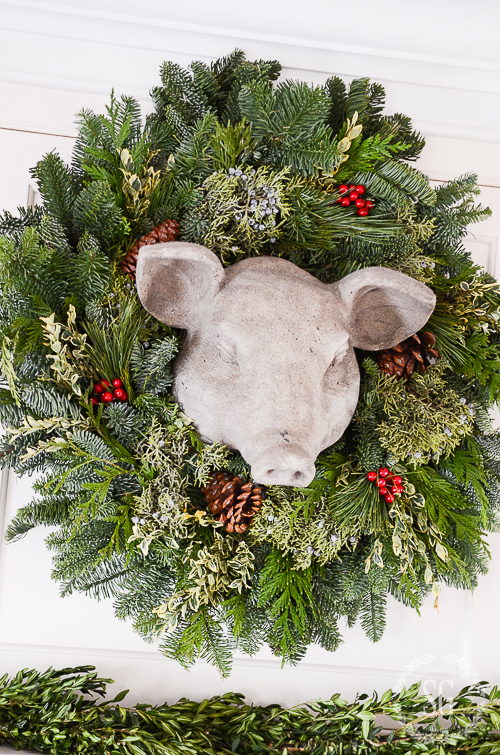 I have a grapevine wreath around my white bull’s head above the pantry door, but now I’m taking my clue from you and going to put a boxwood Christmas wreath around my blue and white pig’s head in the eating area. I always get so many wonderful ideas from your blog. While I like everything you do, Yvonne, I really LOVE this restrained, more simple look. 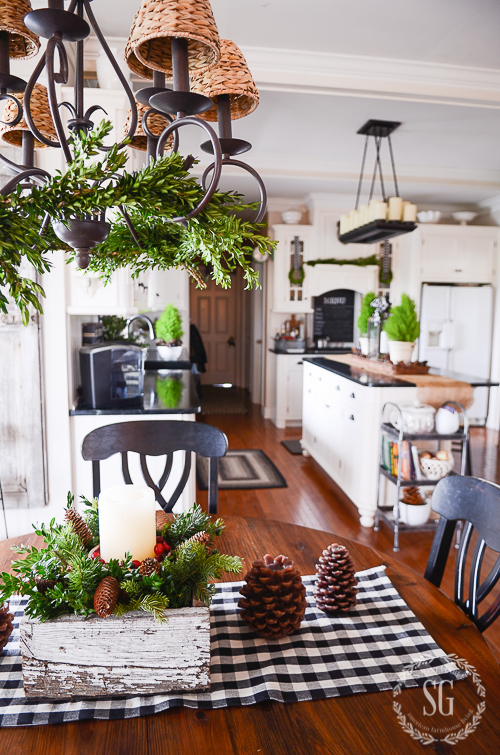 It has “just enough” to give the kitchen warmth and style and the Christmas feeling without a person feeling claustrophobic and scared they might knock a decoration over. Maybe another way of putting it is … it looks real and “believable”! The reader can envision her/his-self actually baking in that kitchen yet at the same time, enjoy all the eye candy you’ve provided. Perfect job! 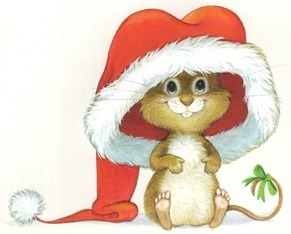 Love, love ,love the little mouse ! Your kitchen is so pretty . I knd of imagine your house to smell like a forest, the really yummy smelling kind! Oh, how lovely! Thank you for wonderful imagination! 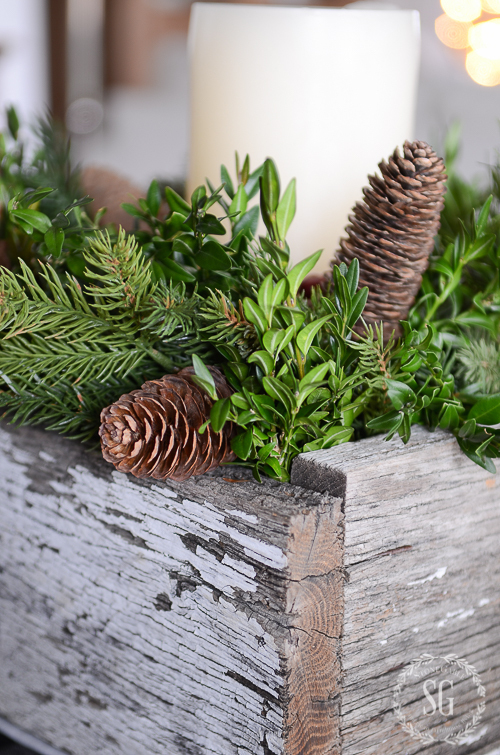 I love your use of pine cones and greens, with the white containers. I collect white pitchers and love to use them whenever I can. They are a constant reminder to have a servants heart. You inspire my creative heart. Thank you. I love your kitchen. My dream kitchen would be white cabinets and black counters. It goes with everything. You can change the look for holidays and everyday. Love your blog and your look. 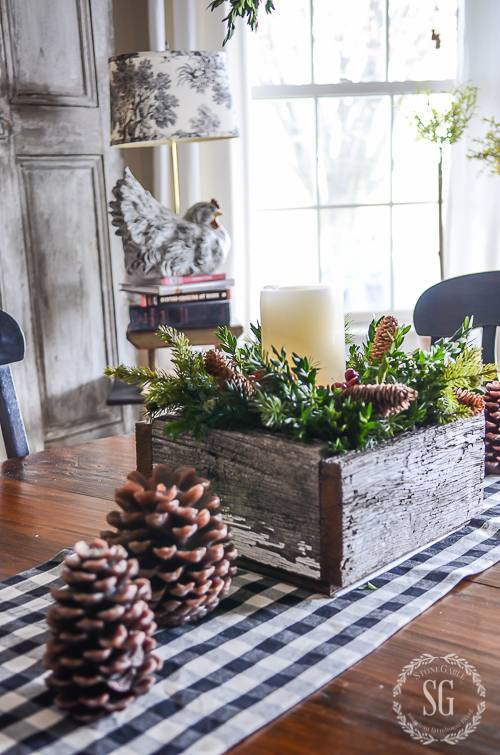 This year my theme is ,rustic, neutral colors, lots of pinecones, burlap ribbon and my reindeer collection. 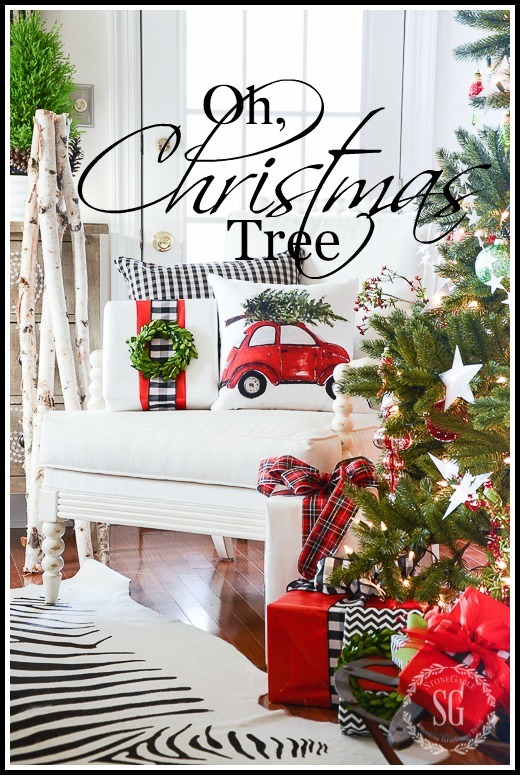 I will use lots of greenery, dried flowers tucked into the tree. I pick a different theme every year as I have a variety of collectios, snowmen, Santas and trees. Your home is lovely and has given me some great ideas! Where did you get the large pinecones? Yvonne, everything you do is so beautiful. I love your kitchen and especially your three tier cart. I remember you said you picked it up at HomeGoods and I have been looking for almost a year at HomeGoods and online. Is there a brand name on it anywhere that I can research. Thank you girlfriend. 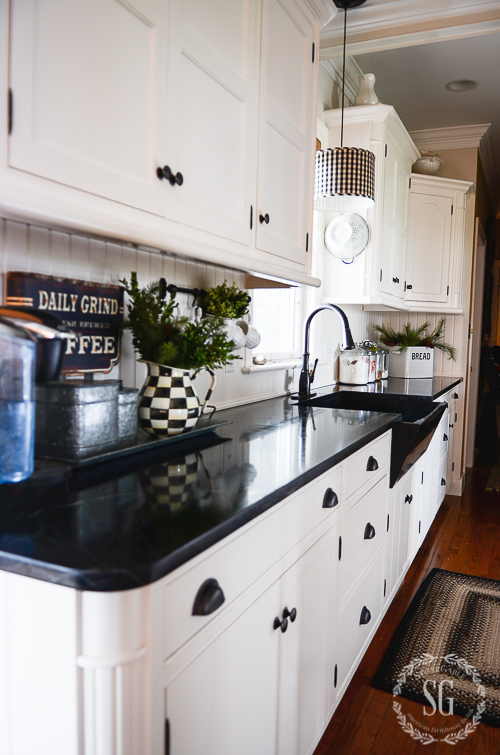 Yvonne, No wonder everyone gravitates to your kitchen, it’s so cozy and inviting! You add the perfect amount of Christmas bling. Love it! Your home always looks so inviting, Yvonne:) Everything is beautiful, and thank you for sharing so many amazing ideas! oh Yvonne, you have such impeccable sense of decorating. I always feel like I can just step right in, put an apron on and help you in that beautiful kitchen. Merry Christmas to you, Bobby and your precious family. I am looking forward to seeing you in 2016 either at Stone Gable or here at Duke Manor. Love and hugs. Yvonne, your kitchen is my favorite!!! 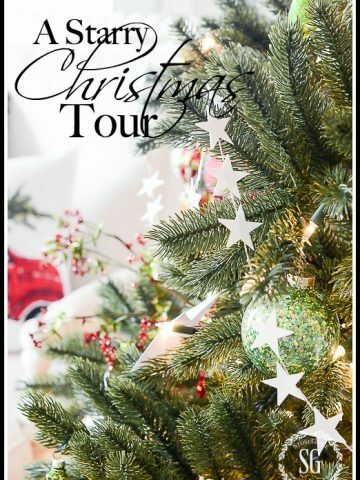 Love how you have added beautiful Christmas touches! And I love your chalkboard over your stove, what a fun idea! Wishing you and your family a Merry Christmas! Love your blog. Your kitchen is beautiful and has all the special touches. I love the way you use aprons in your kitchen. 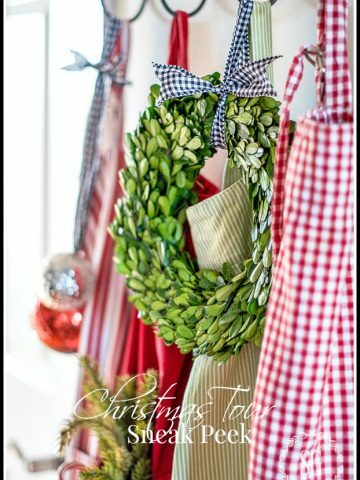 Did you ever do a tutorial on how to make the plate hooks to use for hanging aprons? Where did you purchase your plate hooks? Thanks for sharing !! Your kitche is beautiful! I love the wreath around the piggy! I tried to comment on your bedroom post but it says I am spam! I wanted to say I love the garland draped over your first bed! Yvonne, Love your style of making your home beautiful and inviting. Thank you for sharing, You’ve inspired me and I have used many of your ideas. Merry Christmas! So very tasteful. Love the clean lines… yet very traditional in it’s simplicity. Merry Christmas Yvonne. Made me smile Yvonne. Love it! You consistently wow us with your sophisticated, yet “unfussy” decor. You inspire your readers in every post. 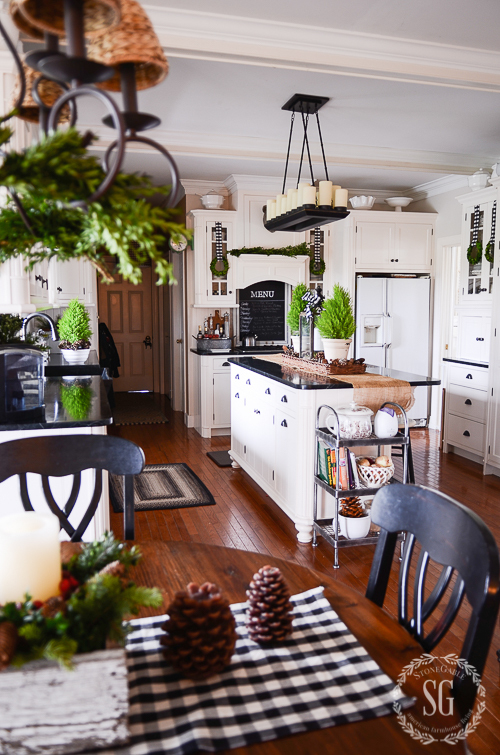 Thank you for sharing your lovely Christmas kitchen with all of us who faithfully read your blog. Yvonne, I have so many blogs in my feed but yours is the one that is consistently outstanding! You give me so many ideas, thank you for having the aesthetic that resonates with me! How nice of you to say! Thanks! off of your how to from 2010. Your kitchen looks fabulous. I love the cute touches, like your big jars and aprons. I love that you have kept it kind of minimal, but added stuff in the right places. I just got many ideas from this post, on the the kitchen! Your home is so lovely. Can you tell me your favorite place to purchase faux greens? 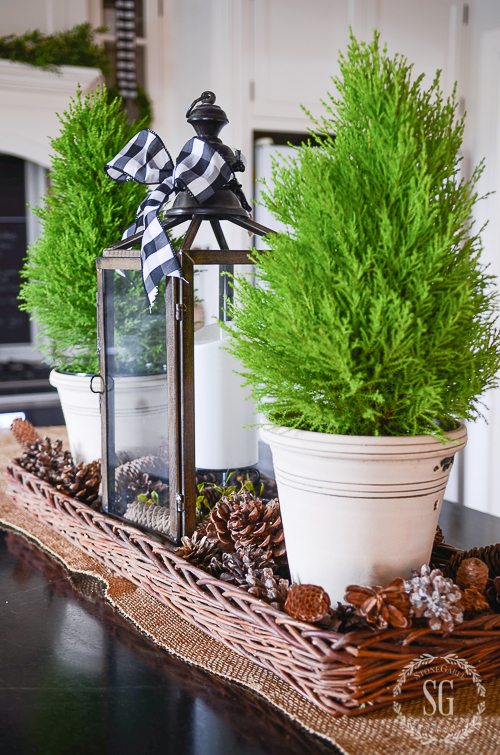 The faux greens you used in your table top decoration look very nice. Thank you! Hi Wendy, I have found the best place to find great looking faux greens is at local home and garden shops. We have The Old Millhouse Shoppes there that is loaded with gorgeous greens. You can see their online shop. I love all the decorations throughout the house, It is not over-done, practical, colourful and homely. A home where I will feel ‘welcome’ in. Enjoy all the blessings. Thanks for sharing your lovely ideas. Yvonne I just love your kitchen. A Christmas wonderland! We are re-doing our kitchen in the New Year. Is the bead board easy to clean? What is your opinion on porcelain sinks? Would love your honest comments. Beadboard is easy… just keep up after it. I can’t say about porcelain sinks… I had one and I’m not a fan. Love, love your decorating style. Where do you get the black and white ribbon? Can it be ordered? I love it! Hi Julie. Thanks! I found this ribbon on Amazon. Absolutely beautiful! My favorite room in your home…wish I lived close to pop in for tea. Love those little boxwood wreathes. Just cannot seem to find them in the Twin Cities. I have a candy cane house – love it. Back in the 70’s there was a gal that would do home shows and sell her ceramic ornaments, replica ornaments of your home with the street address on them and this darling candy cane house. The roof has openings to tuck them in and it is a favorite decoration of mine. I’m thinking my boys will challenge each other on who will have it someday. I just purchased candy cane suckers at a local shop in St. Paul last night. There is also a wonderful candy shop in St. Paul, Regina Candy that hand pulls their own candy canes. They do ship if any of your readers are looking for a unique surprise for someone. 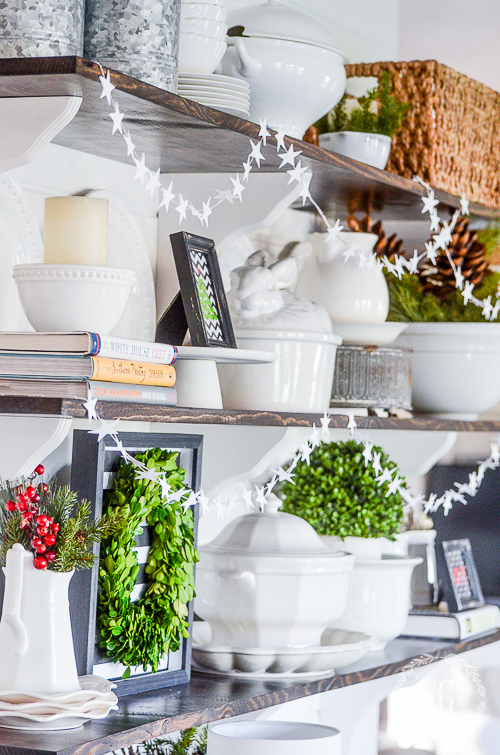 I would love to come hang with you in your festive kitchen!! 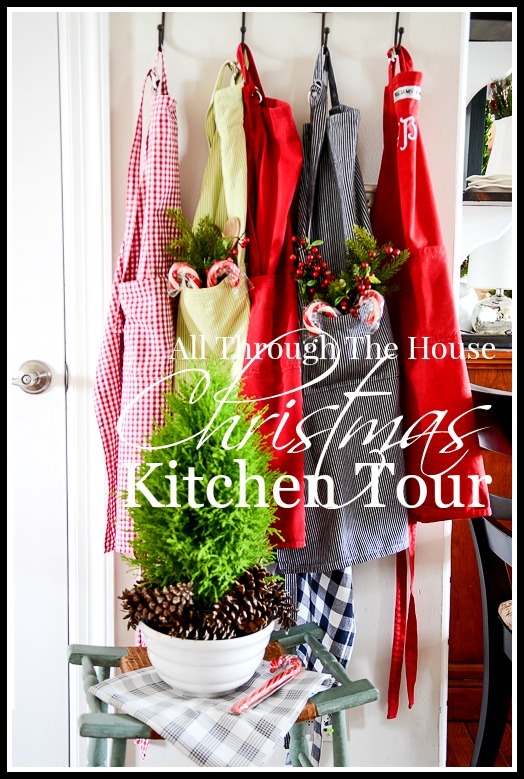 Your kitchen is gorgeous every day…and dressed for Christmas it truly is so very special….Love all of the beautiful details Yvonne…and you had me at those aprons!!! I love the simple Beauty of your decorating. I get so many great ideas from you! Love your posts! Merry Christmas! So, so beautiful, Yvonne! Your kitchen is always one of my favorites. 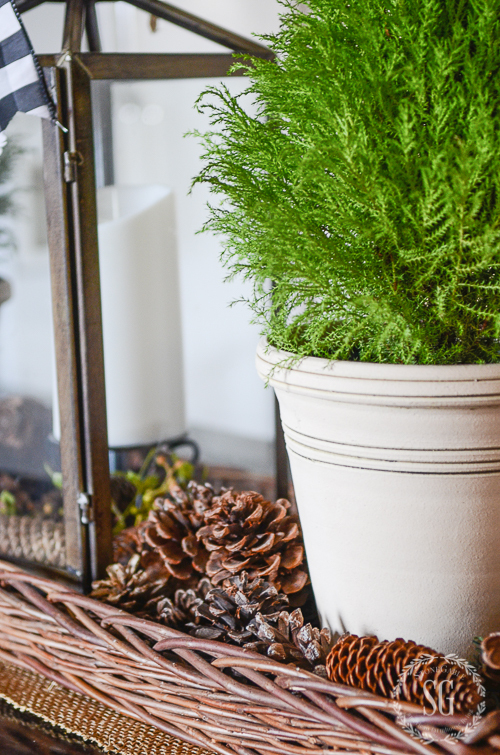 I love, love, love the fresh greenery that you’ve used everywhere. It’s just perfect! I love your kitchen, Yvonne! Especially at the holidays. So welcoming and warm with so many beautiful details! 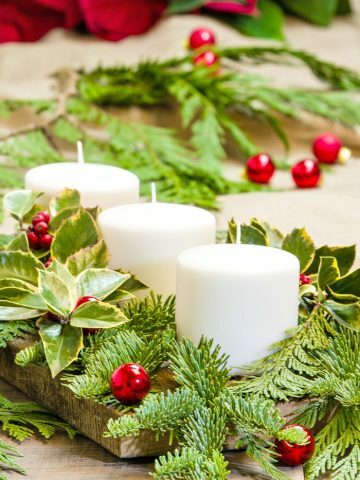 Hi Yvonne….beautiful, simple Christmas decor. I love all of the natural elements and pops of red! 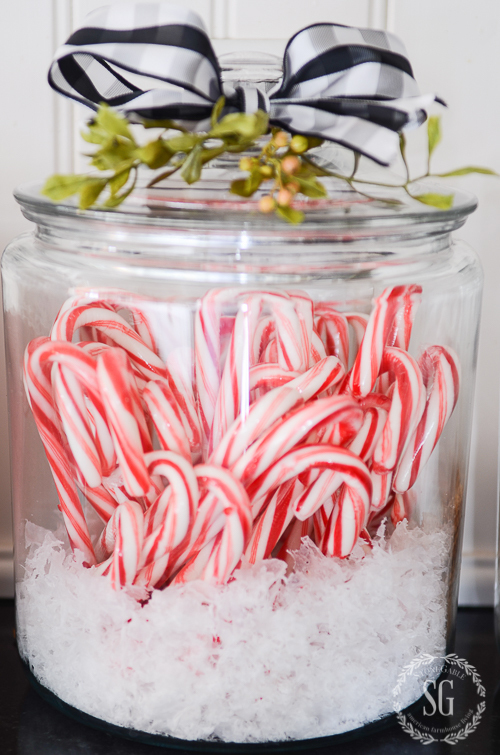 Can you tell me what the filler is that you used in your candy cane jar? Happy holidays to you and thanks for sharing! It’s snow I got from the Pottery Barn Outlet years ago. I just keep using it over and over again!